Me, Edward M. Bury, APR. Want some reasons why? Please keep reading. Long-Time Fandom: As noted, I’ve rooted for the Cubs as long as I can remember. There were good memories, and some not-so-good. (Think 1969, 1984, 2003 — forget it; that’s ancient history.) At the end of the game, my allegiance never faltered. Color Blue: People have told me I look good in blue. Something about bringing out the green in my eyes. And, there will be lots of blue and green at Wrigley Field the evening of the first NLCS game. One of my most prized possessions. Note the “Ball” pin on the brim. purchased back in 1984. Or perhaps it was 1985. 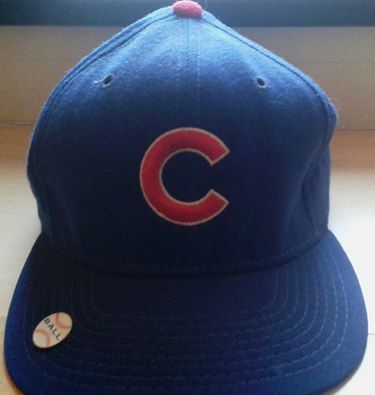 It’s “the same kind the players wear.” I’ve worn it only to games and while watching the Cubs during playoffs. I promise to wear it next Tuesday. I’m an APR. Okay, so why should holding the Accreditation in Public Relations count toward my qualifications? Simple: I don’t have a ticket, and having the honor of throwing out the first pitch would get me a seat. I think. I’m demonstrating open disclosure, a sign of ethical public relations practices. Not a Hater. If you’re like me, you’ve had enough of the references in the media and by fans to “the hated Cardinals” and now, “the hated Mets.” Get over it! It’s a baseball game and the Cub fans need to demonstrate positive energy. As the Cubs prepare to take the field in tonight’s NLCS game in New York, I’ll be rooting for an opening series win. And, of course, I’ll be hoping to get the honor to stand on the mound and throw that first pitch Tuesday. One more thing: I promise to throw a strike. This entry was posted in Uncategorized and tagged Accreditation in Public Relations, APR, Chicago Cubs, Chicago Cubs NLCS 2015, Cubs, Cubs fan. Bookmark the permalink.